College teachers all too often still play Sage on the Stage – lecturing to rooms full of passive and supposedly absorbed students. The cutting-edge opposite is still supposed to be the Guide on the Side – facilitating wherever students themselves are already going, mentoring and coaching them along the way. But who says that these are the only – or the best – alternatives? This book advances another and sharply different model: the Impresario with a Scenario, a teacher who serves as class mobilizer, improviser, and energizer, staging dramatic, often unexpected and self-unfolding learning challenges and adventures with students. In this book, the author argues that to pose a single alternative to lecturing is profoundly limiting. In fact, he says there is no reason to have to choose between “student-centered” and “teacher-centered” pedagogies. The best ways to teach and learn are both. The same applies to the false choice between “active” students and “active” teachers – there can be more than enough activity for everyone. In particular, the author argues that we need a model in which the teacher is notably pro-active – a kind of activity for which certain theatrical metaphors seem especially appropriate. Picture a college teacher who regularly sets up classroom scenarios – challenging problems, unscripted dramas, role-plays, simulations, and the like – such that the scenario itself frames and drives most of the action and learning that follows. For teaching as staging, the primary work of the teacher is staging such scenarios. The basic goal is to put students into an urgently engaging and self-unfolding scenario, trusting them to carry it forward, while being prepared to join in as needed. This book offers a conceptual and practical framework for Teaching as Staging, grounding the approach with illustrative and sometimes provocative narrative from the literature as well as the author’s own practice. 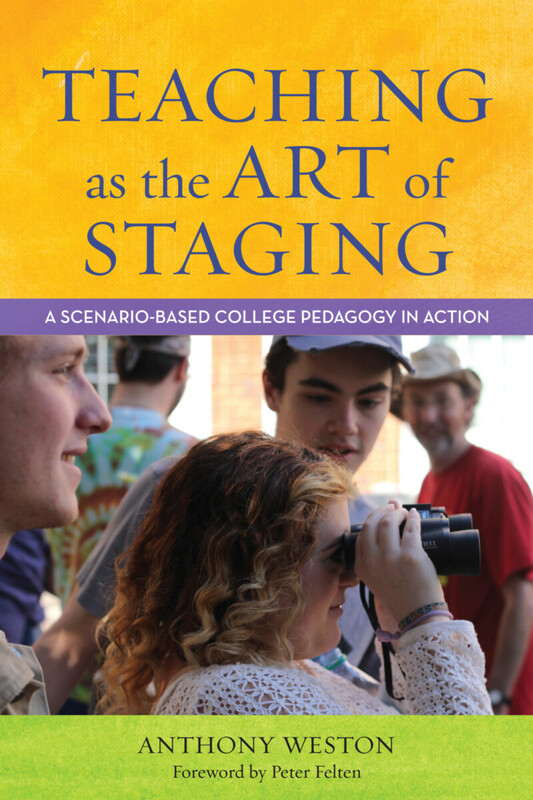 Teaching as the Art of Staging offers a visionary challenge to the prevailing models of pedagogy. The book presents a thoroughly practical model that opens up new possibilities for anyone interested in dramatic new directions in teaching and learning. "Do you want to be a truly creative and inspiring instructor? Then you must read Weston’s Teaching as the Art of Staging. Taking 'student-centered' and 'experiential learning' to whole new levels, his innovative pedagogy relies on staging learning situations and letting your students run with them. Weston deftly demonstrates how you can become an impresario with scenarios, whatever your discipline, by drawing on his broad teaching experience in the sciences, social sciences, and humanities." “For those who believe that higher education is stuck in a rut, Anthony Weston's far-ranging and provocative book offers a way out: Instructors can move beyond being energized performers ('sage on the stage') or wise facilitators ('guide on the side') and instead become 'impresarios with scenarios' who educate students by staging powerful active-learning experiences. Weston surveys scores of different 'staging' techniques and supplements them with many ingenious examples from his own classroom." Anthony Weston is a professor of philosophy and environmental studies at Elon University.